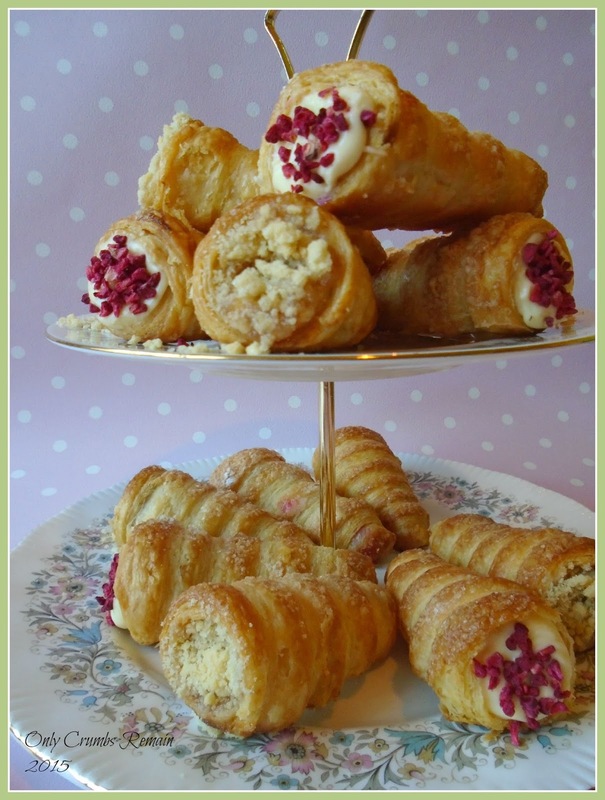 A GBBO 2015 inspired bake, these cream horns have been flavoured two ways. Firstly with a beautiful lemon posset and raspberries; and secondly with the British classic of apple crumble and custard! How dramatic was this week’s GGBO episode which saw the contestants having to leave their Religieuse a L’ancienne for two hours to see if they collapsed whilst they had lunch! I wonder how much they managed to actually eat?! So this week’s episode focussed on patisserie. The contestants were challenged with making 2 different flavoured Cream Horns in the signature dish, mini coffee flavoured Genoese sponge cakes called Mokatines in the technical challenge and a Religieusse a L’ancienne, a nun sculpture made of eclaires, in the showstopper. Mr E & I soon discounted the éclair sculpture. We toyed with making the mini cakes with an alternative flavour given that neither of us like coffee but decided to give the cream horns a whirl. The first flavour combination I made was Lemon Posset with Raspberry. A lemon posset is a historic recipe which sees the heated cream thicken when the lemon juice is added. This mixture was piped into the horns, a raspberry was placed in the centre as a little surprise and then topped with more lemon posset and a scattering of freeze dried raspberries. The second flavour was a seasonal classic of Apple Crumble & Custard, one of my favourites! The cream horn was filled with a crème patissiere, topped with some apple puree spiced with cinnamon and then finished with a sprinkling of crumble. I made our own puff pastry the day before my actual bake, allowing it to chill thoroughly in the fridge overnight. Although puff pastry can take a while to make due to all of the chilling time involved, a necessary step to keep the butter cold, the actual hands on time is fairly minimal. I used some strong white bread flour in the pastry as suggested by Mr P Hollywood and performed only 4 ‘turns’ again suggested in the show. The show advised that too many ‘turns’ can result in the horns collapsing because of the extra air trapped between the numerous layers. Now, as I have never made cream horns before I carried out a little search of the net to see what hints and tips I could find. I came across Wartime Housewife, a site which I found helpful and provided many useful tips for making these little dudes! So, as I have never made cream horns before, I clearly didn’t have any manufactured moulds. So following a tip suggested by Flora, I decided to wrap ice-cream cones in tin foil. The cones I had purchased needed to be trimmed due to the altered angle of the cone. Out of 21 cones, only 1 fractured during the trimming (thankfully!). They were then wrapped in tin foil and greased with butter before being wrapping with the puff pastry strips. The one difficulty I had was removing them from the cooked pastry, simply due the fact that I had taken the pastry a wee bit too near the rim of the makeshift cone. This said, I only had one casualty during this step! Phew! I had intended to ‘paint’ the inside of the pastry horns with melted white chocolate. Although I’ve not seen cream horn recipes suggest this, probably due to the fiddly nature of doing it, it is something which is recommended when making fruit tarts to prevent the filling softening the pastry before they are eaten. Unfortunately the white chocolate which I thought was in the cupboard had already been used! Time: hands on time about 90 minutes; plus chilling time, 30 – 39 minutes total bake time. 1. Make the lemon posset. Place the cream and sugar into a medium heavy based pan. Place over a low heat to allow the sugar to slowly dissolve. Increase the heat slightly and set the kitchen timer to 3 minutes. Once the cream comes to the boil reduce the heat and simmer for 3 minutes. After the 3 minutes add the lemon zest and half of the juice. Beat with a wooden spoon until well combined and smooth. Taste and add more lemon juice as necessary, beat again. Pour into a bowl and set aside to cool. Once cold cover and place into the fridge for at least 2 hours or even over night. 2. Make the puff pastry dough. Place the flours and salt into a bowl and combine with you hand. Add 50g of the cold butter and cut into small cubes. Rub between your fingers to make breadcrumbs. Slowly add the cold water and using a pallet knife, or similar, cut through the mixture until it makes a dough. Tip onto a lightly floured work surface and bring the dough together into a ball and flatten into a disc. Avoid over handling the dough. Wrap in cling film and chill for 30 minutes. 3. Prepare the butter layer. Place the remaining cold butter between two sheets of greaseproof paper. Using a rolling pin pound the butter to flatten it out. Fold it to make the surface area smaller and pound again. Repeat until the butter is soft and more pliable, but still cold. Shape into a square measuring about 12cm. 4. Encase the butter in the dough. Remove the dough from the fridge, unwrap it and place it onto a lightly floured work surface. Roll the dough out into a neat oblong measuring about 15cm x 38cm. Place the butter into the centre of the dough. Cover the butter with the dough. With your fingers (or the side of a knife if your hands are naturally warm) seal the sides of the dough parcel so that the butter is well encased. Turn the dough over so that the seam is now on the underside and sprinkle some more flour on the work surface. 5. Fold and ‘Turn’ the dough. Roll the pastry into a long neat oblong about 40cm long. Lift the pastry edge furthest from you and lay it at the centre point. Lift the pastry edge nearest to you and also lay at the centre point. The two pastry edges will now be butted. Fold the pastry in half along this line. Turn the dough 90 degree to the right. This is one turn. Roll the pastry into an oblong and repeat another turn. Place two thumb marks on the side of the pastry to remind yourself it’s had two turns. Wrap in cling film and chill for 30 minutes. 6. Perform two more turns. Remove the pastry from the fridge and place it on a lightly floured work surface in the correct orientation (ie/ the dough’s ‘smiley face’ is to the right hand side). Roll out into a neat oblong and perform two more turns. The dough will have had 4 turns now. Wrap in cling film and chill for at least 30 minutes (or overnight as I did) until you are ready to make the pastry horns. 7. 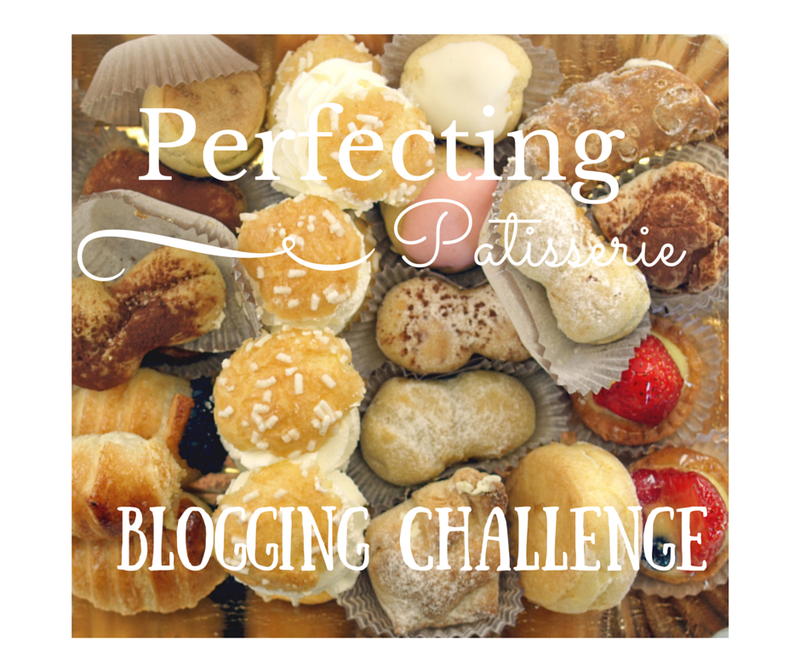 Make the crème patissiere. Pour the milk and vanilla extract into a small heavy based pan and place over a medium heat. Using a balloon whisk, whisk together the egg yolks, sugar and corn flour in a bowl sat on a tea towl. Once the milk is about to come to the boil slowly pour half of the milk over the egg mixture whisking constantly. Pour the egg mixture back into the pan and cook over a low heat, stirring thoroughly all of the time until thickened. Empty the mixture into a bowl. Cover with cling film so that the film is in contact with the mixture. Set aside to cool. 8. Preheat the oven to 180c / 160 fan / Gas 4. 9. Make the apple mixture. Peel, core and dice the two apples. Place into the pan along with the sugar, cinnamon and a little water. Set the pan over a medium heat to cook and break down the apples. Once cooked you may want to puree the mixture with a stick blender (or similar). 10. Make the crumble mixture. Line a baking tray with greaseproof paper which is tacked down with margarine or butter in the corners. Place the flour and chilled butter into a bowl. Rub together with your thumb and finger tips until the mixture resembles bread crumbs. Stir in the sugar. Tip the mixture onto the prepared baking tray. Bake for 10 – 12 minutes, forking through the mixture after 8 minutes. Once baked, tip the crumble into a bowl and set aside to cool. 11. Prepare the horn moulds. If you are using the ice-cream cones you may need to trim the cones with a sharp knife to remove the open section which is at a different angle to the body of the cone. Wrap in foil squares tucking the excess foil in the open end to secure. Grease the makeshift or manufactured moulds with butter or margarine. 12. Prepare the baking trays. Line 2 baking trays with greaseproof paper, tacked down in each corner with margarine. Place the trays in the fridge. 13. Shape the pastry. Remove the pastry from the fridge and place onto a floured work surface. Roll out into a neat square measuring about 38-40cm (this will be the length needed for each cone). Neaten the edges with a sharp knife if necessary. Cut a strip of pastry about 2.5 – 3cm wide. Using a pastry brush lightly paint the upper surface with water. Carefully lift the pastry and with the wet side on the outer side wrap the pastry around the horn in a spiral, overlapping it a little . Trim off the excess pastry and gently apply pressure to seal to the top edge and the pointed end. Lay the prepared horn seam side down on the baking tray. Keep the tray in the fridge. Repeat with the rest of the pastry, positioning them on the tray with sufficient space for them to expand and puff up. Chill for at least 30 minutes. 14. Preheat the oven to 200c / 180 Fan / Gas 6. 15. Bake. Gently paint them with a little milk. Liberally sprinkle with caster sugar. Place in the oven and bake for 20 – 27 minutes. You may need to rotate the tray after about 15 minutes. 16. Cool. Once baked remove from the oven and place onto a cooling rack. After 5 minutes remove the horn moulds from their centre. Take your time doing this. Allow to cool fully. 17. Assemble the lemon posset with raspberry cream horn, just before they are required. Stir through the posset mixture and spoon into a piping bag, no nozzle required. Half fill 8 of the horns with the mixture. Place a raspberry into the horn (being careful of the juice emitting from the defrosted raspberries). Fill with some more posset. Stand in a tumbler to allow the mixture to firm up again. Scatter with freeze dried raspberries. 18. Assemble the apple crumble & custard cream horns, just before they are required. Thoroughly stir the crème patisserie to ensure it is smooth. Spoon into a piping bag and three quarter fill the pastry horn. Using a teaspoon add some of the apple compote. Stand the horns in tumbler glasses as they are assembled. Scatter with crumble mixture, firming it into the apple a little with your finger. I'm jealous of your pastry skills, these cream horns look beautiful! Wow! I'm very impressed. These look fantastic (better than the bake-off ones) and I love the flavours you've chosen. 🙂 Thank you for your kind comments Charlotte, though I wouldn't go as far as to say they were better than the GBBO ones. These look lovely! I really like the flavours you chose. I love that you used Flora's tip of covering ice cream cones with tin foil!! Thanks Eb. Flora was a star sharing that tip, I would never have thought of it myself!! Thanks for the kind comments Alice. I can't take the ice cream cone idea as mine, I think Flora mentioned it on the show last week. Had that not been mentioned I certainly wouldn't have bought the actual metal cones as I can't imagine making them very often, as lovely as they are. hahaha, Yes, it can be frustrating but given that I've been doing a LOT of baking over the passed few weeks and much of it being quite rich I totally understand where he's coming from. I have great neighbours and parents who happily sample my bakes and provide constructive feed back when I ask for it. I agree, the apple crumble was my favourite flavour, but the lemon posset & raspberry one is more aesthetically appealing. What unique flavours you've chosen. I've never had a cream horn before, and I always just assumed that they had plain cream inside. I'd love to try your flavours. They look delicious. Aw thank you Andrea. To be honest, I've too have never had cream horns until we made these and, as the name suggests, thought the inner would be just cream of which I'm not much of a fan. So hearing on GBBO that you can fill the horns with a range of things other than cream I came up with these flavours. For me the cream in the posset is much nicer and who doesn't love apple crumble & custard (or crem pat in this cake)?! Aw, don't feel like that, I'm sure it wasn't that bad! I love the idea of the lemon ones – these look so perfect too! Hahaha, what a great word 'hornets'! Not having used a metal horn mould, or eaten one before I wasn't sure how large they should be. It may explain why my parents and I consumed 8 between us the afternoon! … or maybe we were simply being greedy! Thanks Louise, we're not huge fans of cream but lemon posset cuts through that richness beautifully. And apple crumble is just so darn scrummy! Hahaha, they certainly were Zoe! Mum, Dad and I devoured, dare I say, 8 between us yesterday afternoon!! They look amazing and the flavours are fab too, it's very impressive.